Maybe the Yunnan Ethnic Village (or Yunnan Nationalities Village) is one of the most interesting and attractive tourist highlights in southwestern China. It is located in the city of Kunming somewhere southwest of the city, near the Dianchi Lake. This theme park is full of well-landscaped areas and "ethnic villages", which displays the folklore and buildings of 25 ethnic groups who live in Yunnan Province. In the park, each village has the costumes and representative buildings from their particular ethnic background. The representative three are the Bai Ethnic Village, the Dai Ethnic Village, and the Yi Ethnic Village. The Bai Ethnic Village is famed for the Butterfly Museum (the biggest of its kind in China). This museum is a typical Bai construction. It is comprised of rooms and residences on three sides and a wall on the southern side. The southern wall is typically decorated quite beautifully with an ornate flower bed. Part of the reason for this architecture is that Dali (where a majority of Bais live) is a windy town, where the wind, while not very strong, blows all year round. 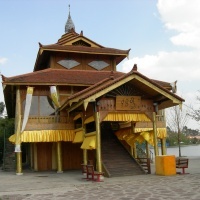 Also in the Village, there is a replicated temple dedicated to the God of Erhai Lake (modeled after a temple in Dali). The young warrior, enshrined in the temple, was known as Duan Chicheng. He exterminated evil villains and spirits for the Bai people and has been worshipped as the safeguard of the Bai people around Dali ever since (I think if you burn several sticks of incense to him, you may also gain his protection). Besides, in this village you can also see the house for tie-dyeing, house for woodcarving, the workshop for marble carving, theater stage, the Three Pagodas modeled from the Chongsheng Temple in Dali, and many beautiful folk houses of the Bai People. The performances in the Bai Village include the Rattle Stick Dance, Straw Hat Dance, and the Dabenqu (a performance with singing, music, dialogue or monologue); the folk events in the village include the Sanyue Jie (a special fair assembly, people deal with trade at day, while singing and dancing in the bivouac at the night, it last around 7 days), Raosanling (a massive singing and dancing gathering which takes place in spring) and Meeting the Bride. 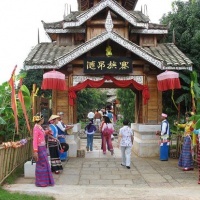 There is a Dali Jie (Dali Street) run-through the Bai Ethnic Village, where you can buy the tie-dyed products of the Bai nationality, straw products, woodcarvings, stone carvings, jewelry and jade wares. If you are tired, you can stop to have a cup of the famous Three-taste tea in the tea house. The Dai Ethnic Village covers an area of more than 4 acres with 3 sides facing water and all with beautiful scenery. Its unique buildings include the wood-bamboo houses, white pagoda, wind-rain bridge, wind-rain pavilion, water well, and the bell pavilion and so on. In this village you can enjoy very wonderful performances such as the Elephant Feet Drum Dance, Gaguang Dance, Dai Wedding ceremony, Dragon Boat Racing, Throw the Small Pillow, Fire the Bamboo Rocket, Tie the Rite threads. The most exciting highlight in this village should be the "water-splashing", which is held in the Water Festival Square. It is copied from the Dai Water-Splashing Festival. Every year towards the end of the sixth month of the Dai calendar (April 13th and 15th according to Gregorian calendar) this festival is celebrated with the Dai New Year's Day. The first day of the festival is for sending off the old and welcoming the new (like many New Years Days of other nationalities). On the second day, a massive water fight engulfs all the Dai villages (including this one) as everyone grabs the nearest basin or bucket, fills it with water and dumps on the closest lucky target as a cleansing blessing of good fortune! Respect is still shown to the elderly who might receive a small cup of water on their arm, but young, able-bodied people should WATCH OUT! This crazy, wild and wet holiday is the best! In this village you will see the Yi people's wine workshop, spinning house, handcrafts workshop, Yi cultural tower, tea hill, and bullring; you will know something about the Chieftain's etiquette of the Yi; you can play Moqiu (something like the seesaw, but it wheels round) and the swings; you may be greeted by the hospitable Yi people by passing you a cup of welcoming wine. You can even take part in all the dances of the Yi people. The "Sun Calendar Square" (Taiyangli Guangchang) is the most spectacular sight in the Yi Ethnic Village, where there is a totem pole, on which are the carvings of suns, fire, tigers, moons, animals and the Eight Diagrams. In the square center is a sundial with twelve animals, which denotes the time of the day (as well as the year of one's birth) in the mystic Yi civilization. In the solar calendar of the Yi people, a year is divided into five seasons, and each season is divided into two months. Therefore, the Yi solar calendar only has 10 months and 360 days in a year. During the Firebrand Festival, people gather here to hold an impressive ceremony. They fire many firebrands and cluster together round the fire singing and dancing. 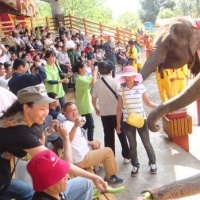 In addition to these "ethnic villages", there are activities that take place such as a welcoming ceremony with performing White Elephants, the Dinosaur Island theme park area, a concert area for ethnic singing and dancing performances, as well as an Asian Elephant show in the Plaza of Ethnic Unity. The climax of a visit to the Nationalities Park is a film shown on a fountain of water. In the Yunnan Nationalities Villages (Chinese: Yunnan Minzucun), the "villagers" are all chosen from the youth of the relevant nationalities to act as guides and performers for tourists. If you get a chance, talk to the different ethnic groups and let them tell you about their beliefs and customs. It can be quite interesting. The park is open 8am to 7pm. To get there, you can take bus NO. 44 (only 1.2yuan); by mini-bus is 2yuan; if by taxi, the ride will cost you 20RMB from the city center of Kunming.